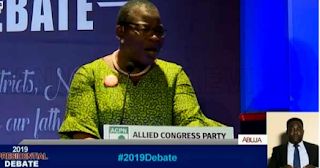 The presidential candidate of the Allied Congress Party of Nigeria (ACPN), Obiageli Ezekwesili, says if she’s elected into office, her administration plans to lift at least 80 million Nigerians out of poverty. “Our plan is to lift at least 80 million Nigerians out of poverty,” she said during the NEDG/BON presidential debate on Saturday. The ACPN candidate intends to do that by first improving the productivity of the majority of Nigerians which she says will enable them to pull themselves out of poverty. She said, “The way that we plan to do this is that when you look at the Nigerians who are poor, it is very clear that they are poor because they earn below 700 Naira a day and live on it. “What, therefore, needs to happen is that this majority of Nigerians, over 50% of them would need to improve their productivity. “When people have higher productivity, they earn more. When they earn more, they lift themselves out of poverty”. Ezekwesili further stated that she would remove the barriers that stand in the way of operators in the services sector, as about 60 % of the economy constitutes services. “The structure of our economy is such that services constitute 60 % of it. “The services are not high-end services, they are low productivity services and so our focus would be on removing the barriers that stand in the way of operators in the services sector. “That would include improvement in policies that target the people in those sectors, removing regulatory barriers that stand in the way of formalization and prioritizing the investments that give public utility,” she said. 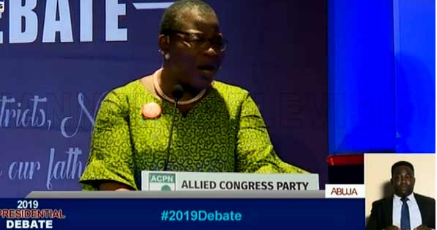 Other candidates present at the debate were Mr Fela Durotoye of the Alliance for New Democracy (ANN) and Kingsley Moghalu of the Young Progressives Party (YPP). The candidate of the All Progressives Congress (APC), President Muhammadu Buhari, and that of the Peoples Democratic Party (PDP), Atiku Abubakar, were, however, absent.